The groom finishes reading his vows to his bride. There is something so intimate and personal about reading handwritten vows that makes this part of the ceremony even more powerful. Even as he reads, the groom keeps glancing up and staring into his bride’s eyes as he declares his love to her in the most beautiful, poetic way. The groom looks so handsome with his white rose boutonniere at his lapel, his awesome bow tie, and his deep blue Elton suit. 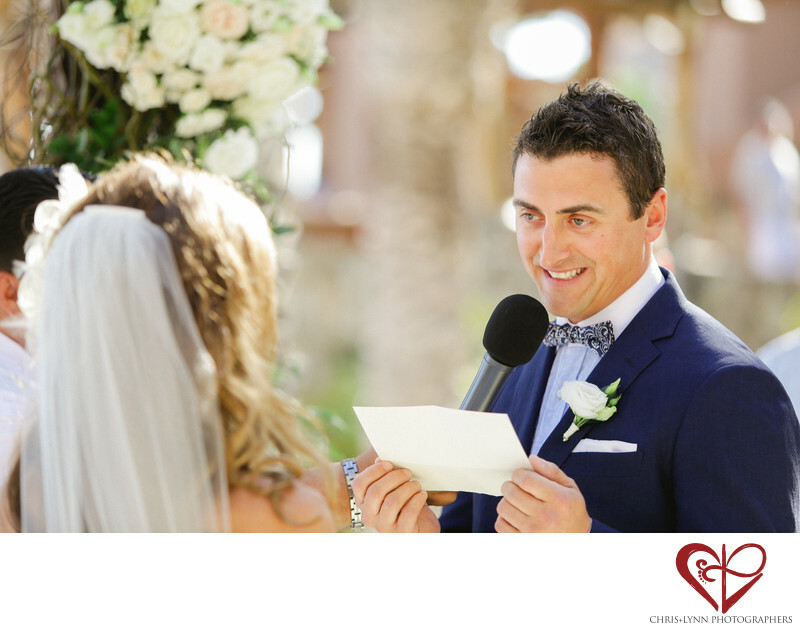 With a big smile on his face, the groom reads his innermost thoughts about love to his beautiful wife to be. The sun shines down on the bride as the groom looks at her. 1/800; f/2.8; ISO 400; 145.0 mm.